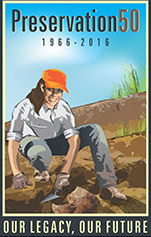 To commemorate the 50th Anniversary of the National Historic Preservation Act, the State Historical Society of North Dakota is inviting everyone to celebrate local history and cultural resources that exist in their community June 17th-19th. The organizations listed below have agreed to participate by hosting special programs, presentations, or tours that highlight history in their area. Special events will also be held at State Historic Sites. If you have questions about a particular event, please contact that organization. If you have questions about the 50th Anniversary or about joining this list, please contact Lisa Steckler, lsteckler@nd.gov or 701-328-3577. Announcements when organizations join the celebration can also be found on our Facebook page. "Hobby in the Lobby" - Local collectors will be displaying regional artifacts and special collections related to North Dakota History and historic preservation. 5th Minnesota Infantry Company D. Civil War reenactment unit will be displaying Civil War equipment and special collections. Sunday History Program - Special presentation by meteorologists Rob Kupec and Darell Ritcherson - " Joseph Nicollet, The Great Map Maker of this Region" Special music will be provided by pianist Addie Christensen. For more information, contact Lenny Krueger, site supervisor, at lkruger@nd.gov or 701.553.8513. Grand Opening of the newly restored attic playroom. For more information, contact Johnathan Campbell at 701.328.9528 or jcampbell@nd.gov. A Mandan Indian site occupied for approximately 40 years, from circa 1550 to 1590 A.D., Chief Looking's Village will be the site of a two week archaeological project. Tours of the site will include a brief walking history tour and an education exhibit furnished by the State Historical Society of North Dakota. Professional archaeologists will be on site to answer questions about the project and the history of the village. The interpretive tours are free and open to the public and will be hosted by the North Dakota Archaeological Association. Registration is encouraged but not required. 10 a.m and 2 p.m. Questions and registration can be directed to Doug Wurtz at dwurtz@bis.midco.net. Capital in Farm Country Bismarck walking tour. This historic walking tour of downtown Bismarck, hosted by North Dakota Parks and Recreation, recounts major turning points in North Dakota farm history where they happened. Sites highlighted include the old Northern Pacific Railway Depot, the Patterson Building, meeting points of the Non-Partisan League, "Bloody Fourth Street" and more. The tour concludes at the Former Governors’ Mansion State Historic Site, where participants can also enjoy the Attic Playroom Grand Opening taking place at the same time. Tour sponsors include the Lewis and Clark Fort Mandan Foundation, the Bismarck Historical Society, Bismarck Veterans Memorial Library, and the State Historical Society of North Dakota. The tour starts at Camp Hancock State Historic Site at 101 E. Main Street at 1:00 p.m. and will involve about a mile of walking. The tour typically lasts about an hour. Participation is free, and this year no RSVP is required. For more information, contact Robert Hanna at rhanna@nd.gov or 701.462.4330. “Come for a Visit & Stay for a Story”: Celebrate the 100th birthday of the Historic 1916 Buffalo High School & the renovation of the Bell Tower from the 1902 Buffalo Public School. For more information, contact Liane Stout, CBHPC Coordinator, jolistout@ictc.com. Join us for a walking tour of historic downtown! We will visit 10 locations on the National Register of Historic Places. Daytime historic walking tour open for families, midnight haunted walking tour for 18+. 12 p.m. and 12 a.m.
Pioneer Picnic in the Park: Calling all Pioneers for a day of Play! Test your skills at Pioneer home life, school and building a community. Bring a picnic or purchase concessions, but just make sure you join in the fun! Features over 100 years of area history plus an extensive library available for genealogical research. For more information, contact Dorothy Johnson at 701.644.2713. A collection of historical artifacts from Wells County including historical documents, antique machinery and cars, and a rural schoolhouse all housed in 4 buildings on the Fairgrounds. A step back in time: Tour an original Homestead Farm, to include house, barn and other out buildings from the late 1800�s to early 1900�s. Walking tours of the Downtown Historic District. Limited to 15 people per tour, 2 tours running at each time. Commissioners will be handing out brochures for self-guided tours of historic downtown. Self-guided Tour. UND's Women's Gym (1907) was transformed into the State Art Museum in 1985 – Architect Harvey Hoshour’s only building outside of New Mexico. For more information, call 701.777.4195. From the Civil War, to WW I, WW II, Afghanistan, and the National Guard, the five-generation military display of the Randy Raasch family features vintage objects, memorabilia, stories. Hillsboro Days, a fun community event for the whole family! Tractor Pull- June 18 starting at high noon until 4:30 with a Brat feed from 11:30 till 1 pm. The Plummer House Museum at 306 W. Caledonia Ave will be open the 18th and 19th 2-4 pm. For more information on the Tractor Pull, contact Rob Bell at 701-430-3150. For more information on all the activities for Hillsboro Days. visit cupofcoffeeaway.com or contact Beth Melby at 701-430-2309. The Hurd Round House, which has been completely restored by Wells County Historical Society, was originally built as a land office to impress prospective buyers of unused railroad land that was put for sale and sold to homesteaders in the early 1900s. The house features a unique round roof style and is listed on the National Register of Historic Places. We have 25 old buildings that share the time of prairie living. The Frontier Village Press has history telling about each building and other things happening in this old west town. There are pony and stagecoach rides, for $5.00 per person. On Saturday we will have a Wild West Shootout at 3pm. There will be a blacksmith Demonstration from 10 - 4pm. We have a Louis L'Amour exhibit and of course you will be able to enjoy Dakota Thunder (World's Largest Buffalo) and the opportunity to see White Cloud, the albino Buffalo and the rest of the herd. For more information please contact Nichole Mosolf, Frontier Village Manager at 701-320-2629 or leave message at 701-320-2725. Guided tours of 3 country schools dating from 1888 to 1914 and an 1881 log cabin. All of the buildings have been painstakingly restored to give an idea of what it was like to go to school in a one room schoolhouse. The log cabin was built by homesteaders on the shores of Stump Lake and is dedicated to its previous pioneer owners. For more information, contact Les or Jan Ferry at 701.247.2297. Guided tours on railroad history in the state of North Dakota or tour our large facility on your own. We will also have mini-train rides for kids of all ages. For more information, visit www.ndsrm.org or e-mail ndstaterrmuseum@gmail.com. The Manfred Heritage Museum of Manfred, North Dakota is looking forward to welcoming visitors in celebration of the 50th anniversary of the National Historic Preservation Act. We will provide ongoing tours of our natural historic village of Manfred, established in 1894. Tour the national grasslands; view the effects of glacier movement. Refreshments served. Tours of the Pioneer Village's 12 authentic buildings. Take a walk through History! Pioneer Village is open May 10th through September 30th 2016. �Noon to 5 pm, Tuesday through Saturday, Sunday by appointment. For more information, contact Sue Bergan at 701.839.0785. All Fathers will receive a free tour of North Dakota's only restored bonanza farm and a piece of pie. For more information, call 701.274.8989 or visit baggbonanzafarm.org. For more information, contact Joyce Hinrichs, President, at 701-824-4132. The Eddy County Museum is a beautiful three-building complex and grounds, including the Schoolhouse, Church, and Train Depot buildings. Each is filled with historic furnishings and exhibits highlighting our region's past. Offering tours of our three historic buildings, with free cookies and coffee for guests. Our museum will be offering tours and cookies Admittance is free of charge. The Doc Hill Building which is on the National Registry of Historic Places is one of our museum buildings on main street Regent, ND. The Hettinger County Historical Society Museum features an ethnic museum, pioneer dioramas with antiques, along with tool and farm machinery collections. The HCHSM also houses a rural church, schoolhouse, variety store, and local blacksmith's shop. For more information, contact Don Wagendorf (Curator) at 701.563.7798 or HCHSM Staff at museum1@ndsupernet.com. Free admission for all fathers, in honor of the 50th anniversary of the National Historic Preservation Act and Father's Day. North Dakota has long been the most agricultural state in the Union. North Dakota’s rich farmland and climate is conducive to a diversity of crops and livestock. The farm standard of living is high but the farm population is decreasing. Farms have increased in acreage, decreased in number, and decreased in crop diversity as technological advances are made. Schools and churches are reduced in number by consolidation and merger. Let’s explore alternatives provided by a focus on diversity in gardens and fields for the health of communities of people, plants, animals, and soil. Sue Balcom, writer, oral history collector, German from Russia cataloger, etc. from Mandan, ND talking about German from Russia food. Heritage Hill Open House - Heritage Hill, home of Taylor Horse-Fest in Taylor, ND will be open for visitors to tour the Red Barn, Grandvale School house, Blacksmith shop and Log Cabin. Exhibits will include horse drawn equipment, a sawmill, blacksmithing and tinsmithing equipment, and other antique farming equipment. Self-guided tour of historical sites throughout Richland County; Walking/biking tour of Wahpeton sites. Pick up list at museum any Tuesday, Thursday or Saturday in June, 1-4pm. Door prizes June 18. For more information, contact the Richland County Historical Museum at 701-642-3075 or richco.museum@702com.net, or visit richlandcountymuseumnd.com. Our museum is open for tours. There is a one-room schoolhouse also for viewing. Concert at the Confluence. The public is invited to a concert featuring Jim and Cheryl Lingenfelter at the Missouri-Yellowstone Confluence Interpretive Center. For more information contact Site Supervisor Steve Reidburn or Assistant Site Supervisor Kerry Finsaas at 701.572.9034. A pioneer country Doctor who served Stutsman and Kidder Counties. Complete office and supplies, medical manuals and pictures that he used in his practice. Many local artifacts, arrowhead collection, rocks, and video of local pioneers telling stories of the old days. Other points of interest in the Woodworth area are the Chase Lake Wildlife Research Center, Barnes Lake, and the historical Sibley Trail. For more information, contact Marlene Odenbach at 701.269.9524.